US regulators have cleared the way for the world's first study on human embryonic stem cell therapy. The US Food and Drug Administration have been considering the 21,000 page application for months. The decision by the FDA to give the go-ahead comes at a symbolic moment, just days after the inauguration of President Barack Obama. Since 2001 there have been limits on federal funding for embryonic stem cell research. The decision of the FDA is independent of White House control, but the new president is widely expected to adopt a more pragmatic and science-oriented approach to stem cell research. 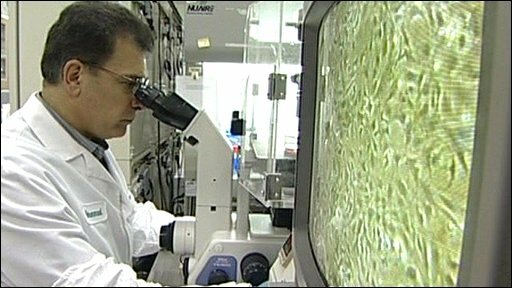 Under President Bush, federal funding had been limited to around 60 stem cell lines created from embryos destroyed prior to August 2001. Scientists had warned that only 20 eligible cell lines remained useful for research and many of these were problematic. Researchers had told the BBC that the restrictions had slowed down their work. Geron Corp, the company behind the research, plans to initiate a clinical trial in a handful of patients paralysed due to spinal cord injury. Interest in use of embryonic stem cells is due to their ability to turn into any of the body's 200 cell types. Using embryos donated through IVF treatment scientists have coaxed the stem cells inside into many types of tissue. One embryo can provide a limitless supply because the cell lines can be grown indefinitely. But the use of human embryonic stem cells in research is controversial with some campaigners saying it is unethical. Geron, a biotech company based in "silicon valley" south of San Francisco, has spent $170m on developing a stem cell treatment for spinal cord injury. The research will use cells coaxed to become nerve cells which are injected into the spinal cord. In animal trials of the treatment, paralysed rats regained some movement. Company chief Dr Tom Okarma said: "What stem cells promise for a heart attack or spinal cord injury or diabetes is that you go to the hospital, you receive these cells and you go home with a repaired organ, that has been repaired by new heart cells or new new nerve cells or new islet cells that have been made from embryonic stem cells." The cells being used in the trial are derived from the H1 human embryonic stem cell line, which was created before 9 August 2001 and thus eligible for federal research funding. However, Geron received no federal funding for the studies leading up to the clinical trial or to support the trial itself. Professor Chris Mason, an expert in regenerative medicine at University College London, described the FSA decision as "historic" and a "pivotal milestone in the development of embryonic stem cell therapies. He said: "The knowledge that will be gained in this first clinical trial deploying embryonic stem cell derived material will accelerate the development of all future stem cell therapies." Professor Pete Coffey, director of the London Project to cure blindness, said: "It's great news for the field. "This strengthens our recent call for regulators in the UK to help provide a clear process for researchers to take this forward. "It's also exciting for me because it brings our own moves towards clinical trials with embryonic stem cells for age-related macular degeneration a step forward." Professor Robin Lovell-Badge, of the MRC National Institute for Medical Research, said it often took 15 to 20 years to develop a therapy. "It takes a long time and much work to derive processes that will efficiently and reproducibly give an appropriate cell type for grafting and many animal experiments to test efficacy and safety. "An appropriate set of patients have to be identified for the first tests and clinicians willing to participate in trials. "And the regulatory hurdle is, understandably, a huge one - in this case it required 21,000 pages of documents." He added that for those patients desperate for treatment, and for their families, the news showed the research is moving in the right direction. But Josephine Quintavalle, director of Comment on Reproductive Ethics (Core), which opposes embryonic stem cell therapies, dismissed the research as "highly speculative". "The work is at a highly experimental stage and there's still a question mark over the capacity of these cells to form tumours," she said. "What worries me is that patients will really believe this is going to cure their spinal injury." She pointed out that other research teams in Australia and Portugal were developing spinal therapies using adult stem cells. "We've never changed our point of view, which is that embryonic stem cell treatments cannot ever be justified," she said.